An operation involving Trading Standards has resulted in the seizure of £2.5m worth of counterfeit and unsafe products. A joint operation between the National Trading Standards Regional Investigations Team Central England, Birmingham Trading Standards, West Midlands Police and partners including the Anti-Counterfeiting Group (ACG), the National Markets Group (NMG) and brand representatives, has resulted in the seizure of £2.5m worth of counterfeit and unsafe products including clothing, jewellery and cosmetics. On January 9, 2019, two entry warrants were executed on a residential home address based in the Hall Green area of Birmingham and one storage unit based in the Digbeth area of Birmingham. The latter took the teams two days to clear out. The warrants were connected to Operation Beorma, a joint National Trading Standards (NTS) and National Markets Group (NMG) operation to tackle the importation and supply of branded counterfeit and unsafe products. Four vans were also searched and a large amount of counterfeit goods seized, along with evidence of manufacturing labels and equipment. 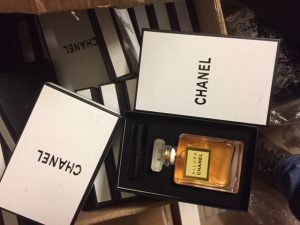 Of particular concern was the seizure of over 50,000 bottles of branded counterfeit perfumes (Chanel, Paco Rabanne, Armani) which the Officers believed to fail to comply with the Cosmetic Products Enforcement Regulations 2013. Cllr Barbara Dring, Chair of Birmingham City Council’s’ Licensing and Public Protection Committee, said: “Trading Standards is completely focused on disrupting counterfeiting rings that fuel organised crime. Black market activities like these pose a serious threat to the British economy in terms of lost profits and tax revenues and may be linked to criminal activities such as child labour and modern-day slavery. Graham Mogg, Anti-Counterfeiting Group Intelligence Co-ordinator and Chair of the National Markets Group, said: “This is an outstanding result and shows the benefit of a multi-agency partnership approach to removing counterfeit and unsafe goods off the streets of the UK. These products were destined for consumers visiting markets and car boot sales as well as those shopping online and on social media, and places them at risk of harm as well as undermining legitimate businesses.